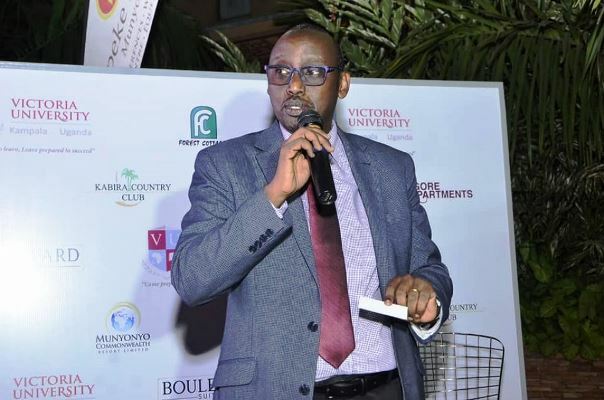 On Thursday April 4, the Tourism and Hospitality fraternity in Uganda converged at Sheraton Hotel Kampala to bid farewell to Steven Asiimwe and John Ssempebwa, the outgoing Executive Director and deputy ED, respectively of the Uganda Tourism Board. The colourful ceremony was graced by notable personalities in the Tourism and Hospitality industry led by the chief guest Prof. Ephraim Kamuntu, the Minister of Tourism, Wildlife and Antiquities. Hoare Kakooza, the President of the Uganda Tourism Association (UTA) the private sector arm of the industry appreciated Asiimwe and Ssempebwa’s invaluable contribution to the sector. She handed them two signed art prints by visual art practitioner, Nuwa Wamala Nnyanzi, who is also the vice chairperson of the National Arts and Cultural Crafts Association of Uganda (NACCAU).Stephen received ‘The Pearl Of Africa’ and John ‘The Kasubi Legacy. Incidentally, it is Nyanzi who did the first ever Pearl of Africa art piece, a gigantic 94×48 feet Batik, more than 25 years ago when he was commissioned for the task by the first Director of UTB Fred Irumba. During Asiimwe’ reign Tourism has recorded some impressive growth, thanks to his efforts to pressure government to recruit tourism promotion companies.